News, tips, and information sessions about cybersecurity. 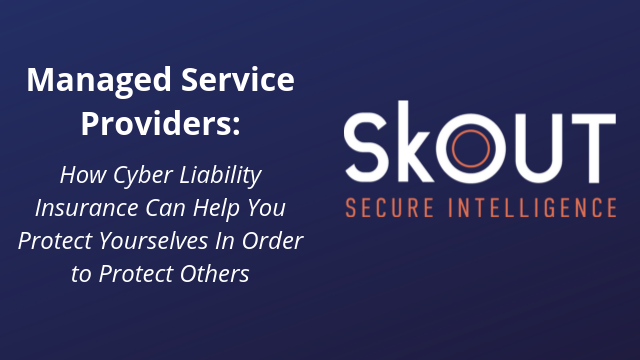 SKOUT is a cybersecurity company that delivers total protection for total peace of mind. Whether you’re an international conglomerate or a mom-and-pop shop we make cybersecurity easy and accessible because we believe security is universal and peace of mind is worth protecting. This webinar will touch on the critical and emerging threats in the cloud that organizations a struggling to manage. Join experts from Ivionics and SkOUT, featuring former government hacker and cyber strategist Lee Noriega and Ivionics Director of Service Delivery Pierre Radecki. Pierre is responsible for overseeing the design, implementation, and support of all IT solutions, as well as establishing and refining processes to ensure consistent delivery of the highest level of customer service. He oversees the employees involved in the delivery process and assesses client feedback to develop quality improvement processes. Pierre has been designing and implementing networking hardware and software solutions for the legal market in New York, Florida, North Carolina, and Washington DC. Pierre has authored several articles, and been a featured speaker and participant on panel discussions for industry events nationally. Our presenter, Oriah Longanecker, has over 20 years of experience as an intelligence and cyber warfare officer in the U.S. Air Force! He's lead a variety of intelligence and cyber warfare units for the National Security Agency and other Intelligence Community organizations, as well as U.S. Cyber Command, and currently leads the cybersecurity and threat intelligence efforts for our partner SkOUT Secure Intelligence in the western U.S.
Data breaches have gained attention with the increasing use of digital files and companies and users large reliance on digital data and electronic record keeping. From Ransomware to Data Recovery, Learn What to Expect in 2018! As cyber security becomes more of a mainstream topic of 2018 business conversation, security leaders must navigate emerging threats, understand developing technologies and stay prepared for 2018 and beyond. Cyber security now goes beyond the realm of IT, and requires full attention and engagement across the business. Join Senior Cyber Security experts and Technology Leaders on a panel to discuss the latest cyber strategies and best practices that organizations should be implementing to help mitigate risk and stay ahead of emerging threats. How to discuss & overcome critical security challenges in your business. The latest about compliance, data breaches and overall security posture. Next steps to take with your cybersecurity strategy. Presented By: Scott Croskey, SkOUT VP of Policies and Procedures and Harry Abt, Director of Managed and Integrated Services, Consolidated Technologies, Inc.
Let's cover your bases. Are You Ready for DFARS? Join Oxford VP of Policy and Standards Scott Croskey as he delves into the finer requirements and directives of the DoD's clarified DFARS Cyber Security Requirements, restating that full compliance is required for contractors no later than December 31, 2017. Are you a Government Contractor or Subcontractor? Are you concerned about any current compliance issues? Has your Organization received an assessment yet? The Oxford Solutions team is on the front lines, making sure that our clients and companies of all sizes are making sure they can report accurately and in a timely manner on developing legislation. Scott Croskey will pose questions and further analysis on DFARS requirements this year and beyond. Take a look into our Cyber Future and identify strategies for security, safety and privacy while leveraging the latest technology. With the explosion of digital interconnectivity, it is critical to explore everyone’s role in protecting our security ecosystem. This seasoned panel will discuss current observations, predictions and recommendations for analyzing and securing tomorrow’s security, addressing the latest trends and meeting new regulatory requirements.